What Causes Semi-Truck Accidents in Florida? In Tampa, Florida, semi-truck accidents occur for many reasons. Often these accidents are catastrophic to the innocent bystanders and fellow drivers. Driver fatigue is one of the top causes of semi-truck accidents. Once a driver has reached the driving limit of 11 hours out on the road, they are required to be off duty for 10 consecutive hours (or equivalent) before driving the truck again. Truck drivers are required to log their hours. However, drivers may log their information incorrectly or erroneously to avoid detection. Other causes of accidents include speeding, improperly-maintained trucks, aggressive driving and reckless driving. Why are Semi-Truck Accidents Dangerous? If a semi-truck collides with a smaller vehicle, then the results can be devastating. The size of these trucks is one of the reasons that it is so dangerous to get in an accident with one. The average semi-truck weighs 80,000 pounds, whereas passenger vehicles typically weigh around 3,000 pounds. Roughly, 27 times what the average passenger car weighs. Basically, a 100 person getting hit by a 2700 car. Common sense will tell you that it is virtually impossible to walk away without an injury. Usually, the driver of the truck is not injured at all. Truck drivers are more protected because they are much higher off the ground. By contrast, people in cars often sustain serious injuries when they collide with a truck. If the survivor of the truck accident escapes death, head injuries, back injuries, amputations, burns, broken bones and lacerations are some of the most common semi-truck accident injuries. People may also be injured by the airbag or seatbelt. Even though these devices are designed to save lives, they can cause a serious injury. For example, the airbag can strip the skin from the driver or passenger. Additionally, seatbelts can injure the user’s abdomen and chest. It is important to get a medical evaluation if you have been involved in a semi-truck accident. If you do not receive a medical evaluation, then serious injuries may go unchecked. If you have been hurt in a semi-truck accident, then you may be entitled to compensation. Accident lawyers in Tampa FL can help you get compensated for future and current medical bills, lost wages, pain, suffering and disfigurement. If your loved one has been involved in a fatal accident, then you may be able to get compensation for their death. 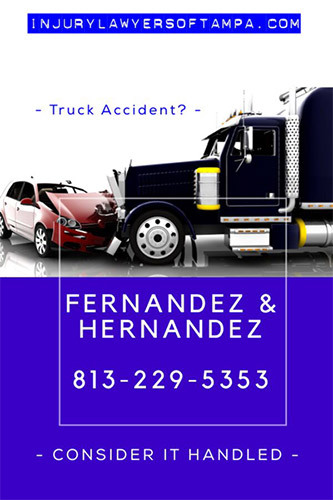 Contact your Tampa truck accident lawyer today! Read more about Tampa Truck Accidents here. Oddly, from 2015 through 2017, the number of fatalities from large truck accidents is up 16%. In 2015, there were 3,838 fatal crashes involving large trucks and buses which is better than 10 years earlier in 2004 with over 5000 people dying as a result of truck accidents and collisions. In the truck accidents, approximately 15% of these fatalities were the drivers themselves, while 72 percent were automobile occupants. The remaining 13 percent were motorcyclists, bicyclists and pedestrians. related accident. At least a third of the injured truck accident victims will suffer either fatal or at least life threatening injuries.